Extended Practical Investigation Yr 10 EPI. 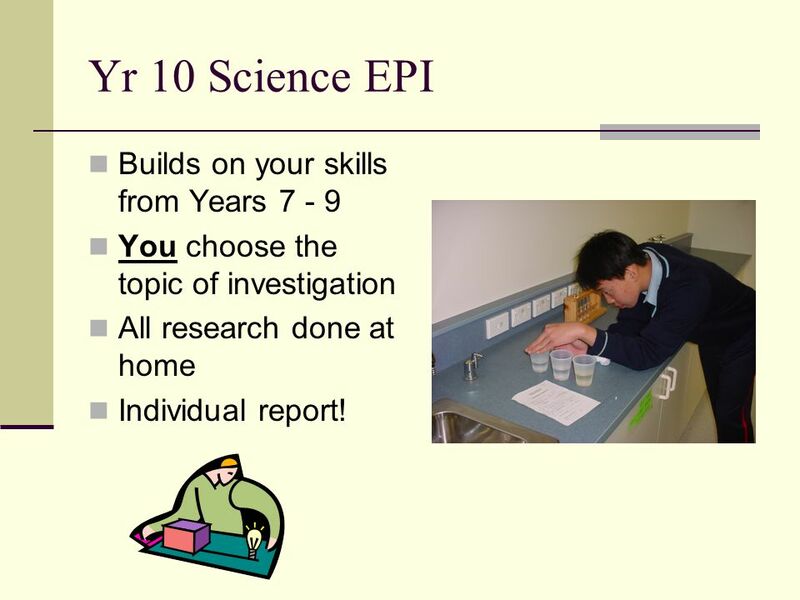 Yr 10 Science EPI Builds on your skills from Years 7 - 9 You choose the topic of investigation All research. 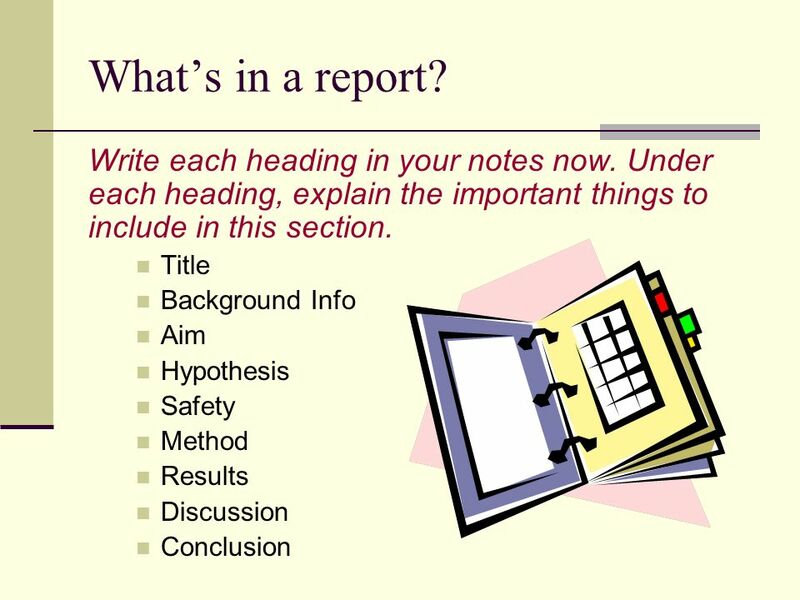 2 Yr 10 Science EPI Builds on your skills from Years 7 - 9 You choose the topic of investigation All research done at home Individual report! 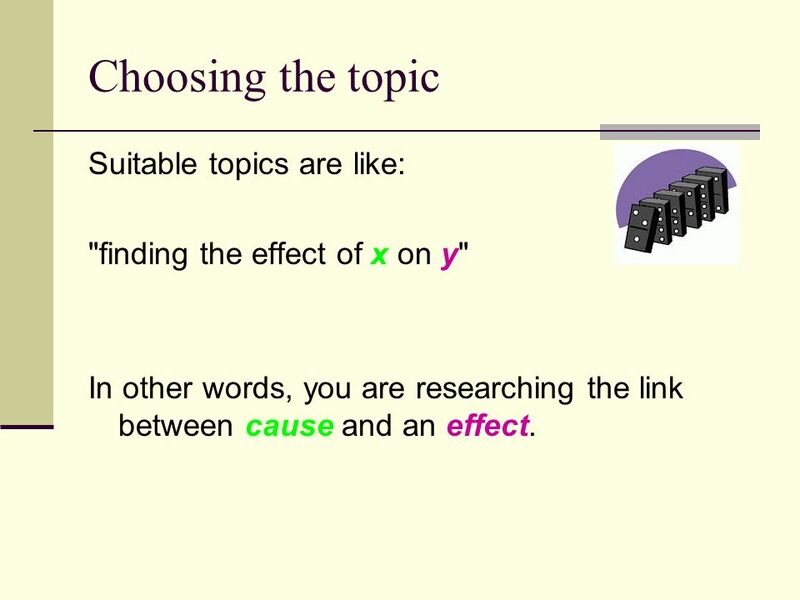 4 Choosing the topic Suitable topics are like: "finding the effect of x on y" In other words, you are researching the link between cause and an effect. 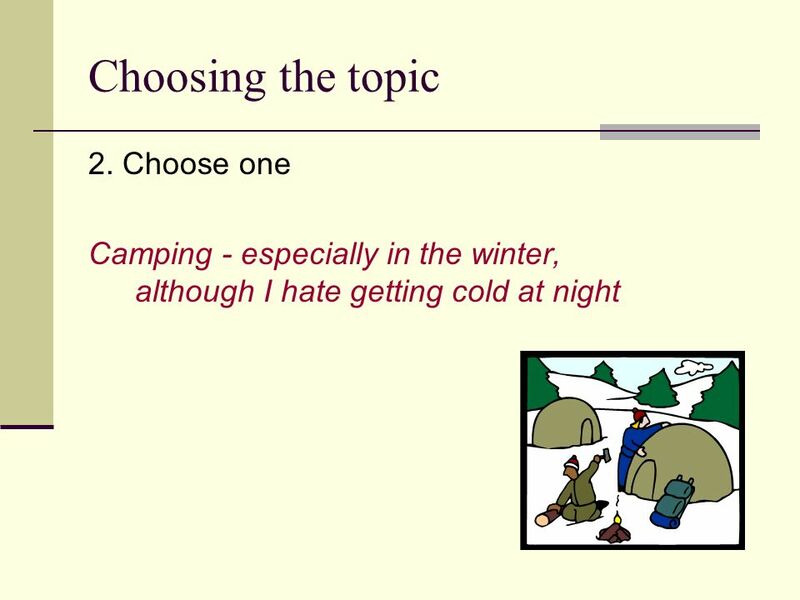 7 Choosing the topic 1. 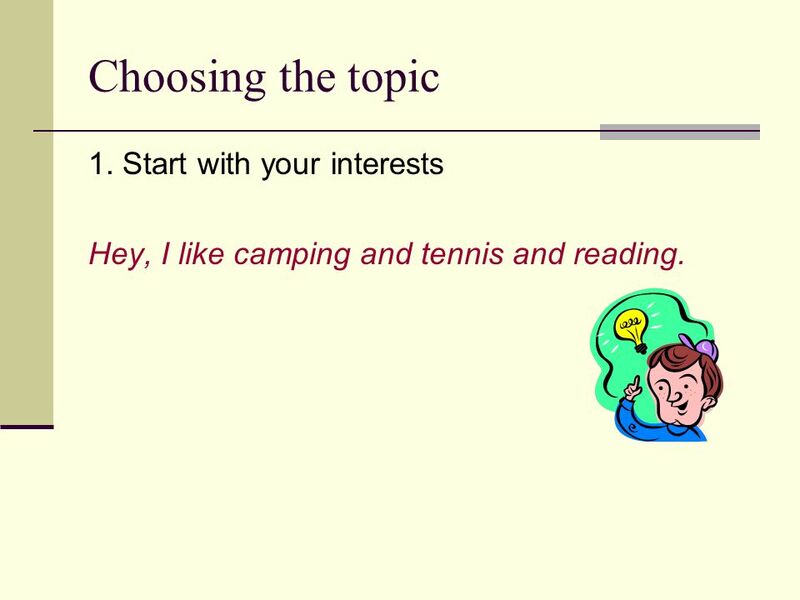 Start with your interests Hey, I like camping and tennis and reading. 9 Choosing the topic 3. Focus on some aspect, perhaps something you have been curious about Hmm... are those really expensive feather-down sleeping bags really worth it? 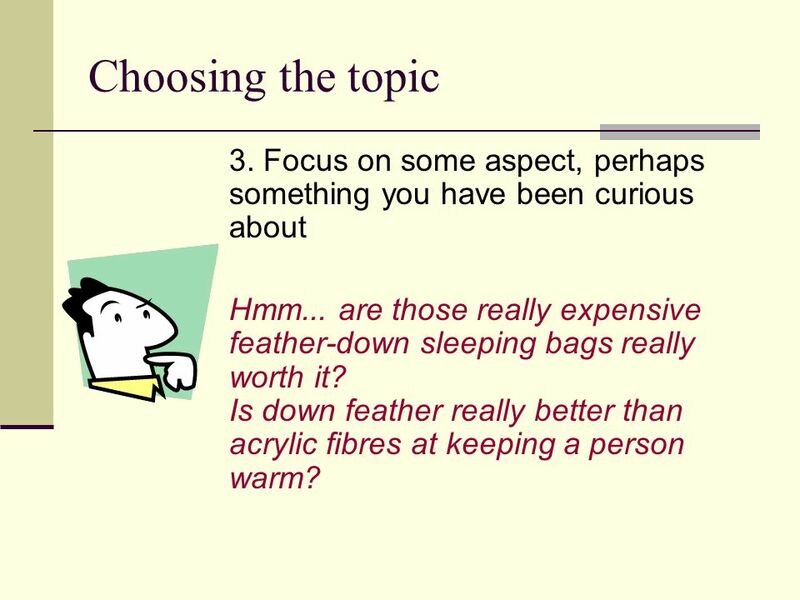 Is down feather really better than acrylic fibres at keeping a person warm? 10 Choosing the topic 4. 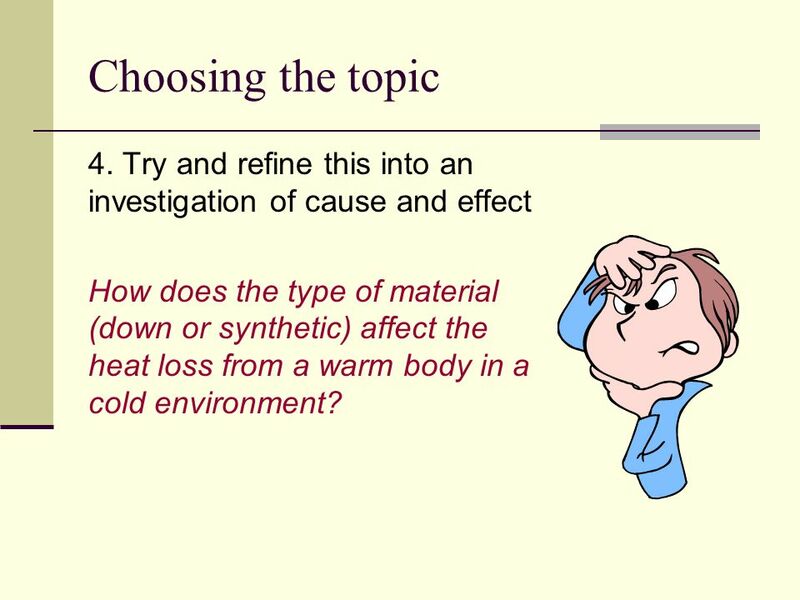 Try and refine this into an investigation of cause and effect How does the type of material (down or synthetic) affect the heat loss from a warm body in a cold environment? 11 Choosing the topic 5. 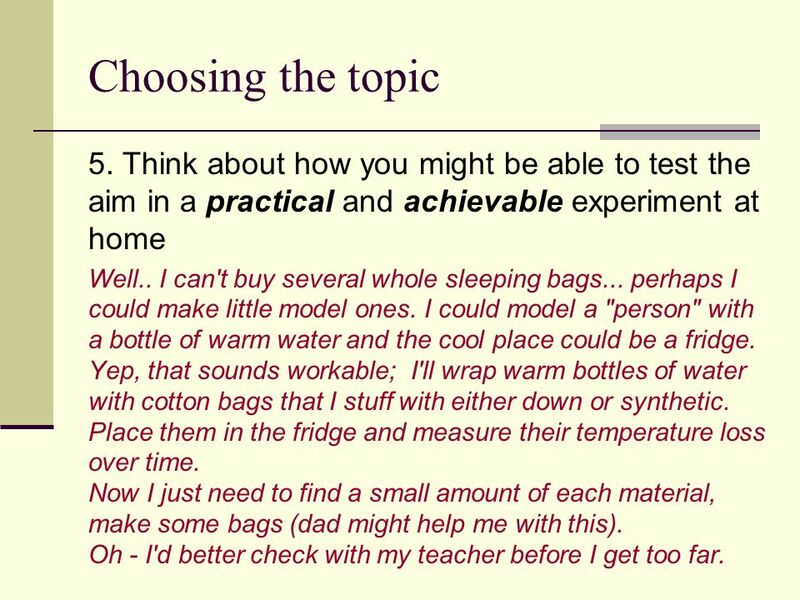 Think about how you might be able to test the aim in a practical and achievable experiment at home Well.. I can't buy several whole sleeping bags... perhaps I could make little model ones. I could model a "person" with a bottle of warm water and the cool place could be a fridge. Yep, that sounds workable; I'll wrap warm bottles of water with cotton bags that I stuff with either down or synthetic. Place them in the fridge and measure their temperature loss over time. Now I just need to find a small amount of each material, make some bags (dad might help me with this). Oh - I'd better check with my teacher before I get too far. 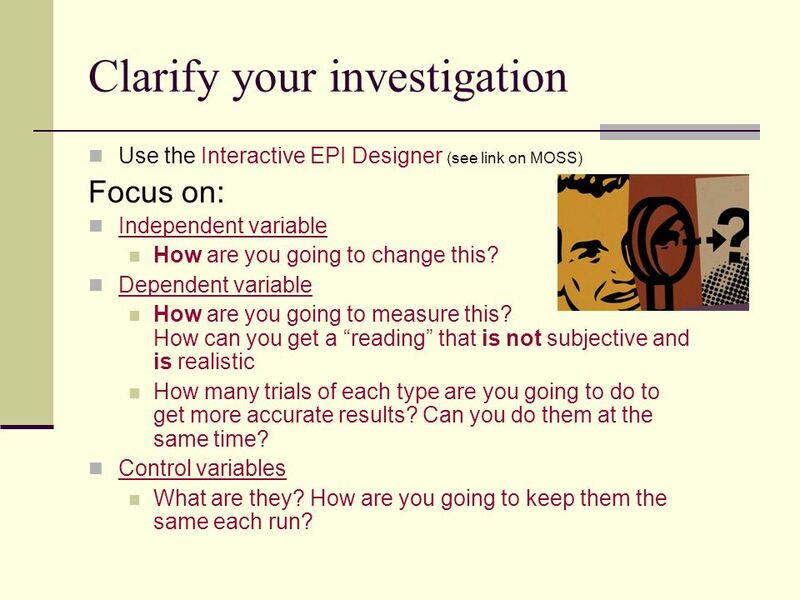 12 Clarify your investigation Use the Interactive EPI Designer (see link on MOSS) Focus on: Independent variable How are you going to change this? Dependent variable How are you going to measure this? How can you get a reading that is not subjective and is realistic How many trials of each type are you going to do to get more accurate results? Can you do them at the same time? 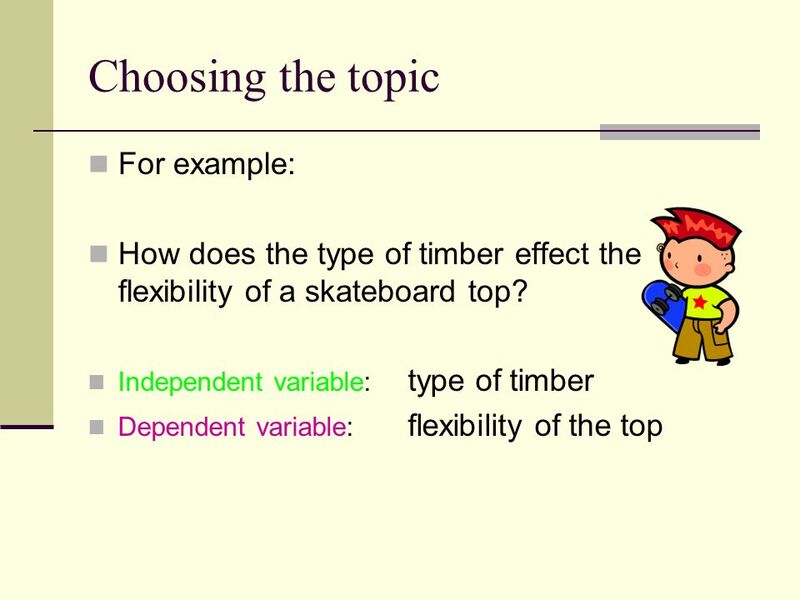 Control variables What are they? How are you going to keep them the same each run? 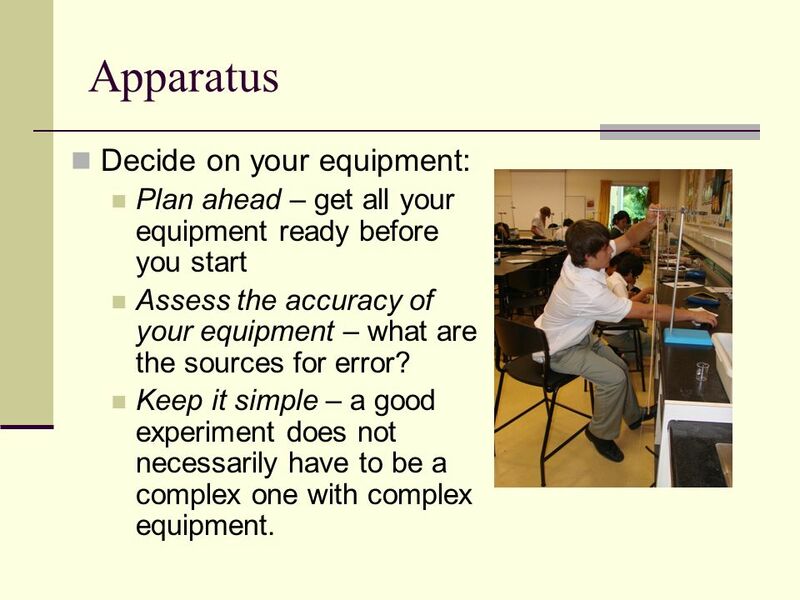 13 Apparatus Decide on your equipment: Plan ahead – get all your equipment ready before you start Assess the accuracy of your equipment – what are the sources for error? 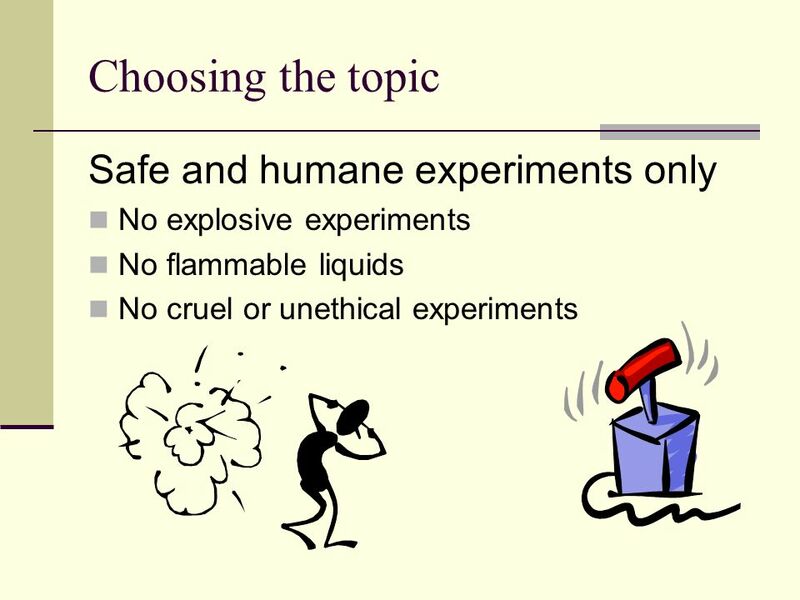 Keep it simple – a good experiment does not necessarily have to be a complex one with complex equipment. 16 Some ideas How effective are different cleaning solutions in removing stains? 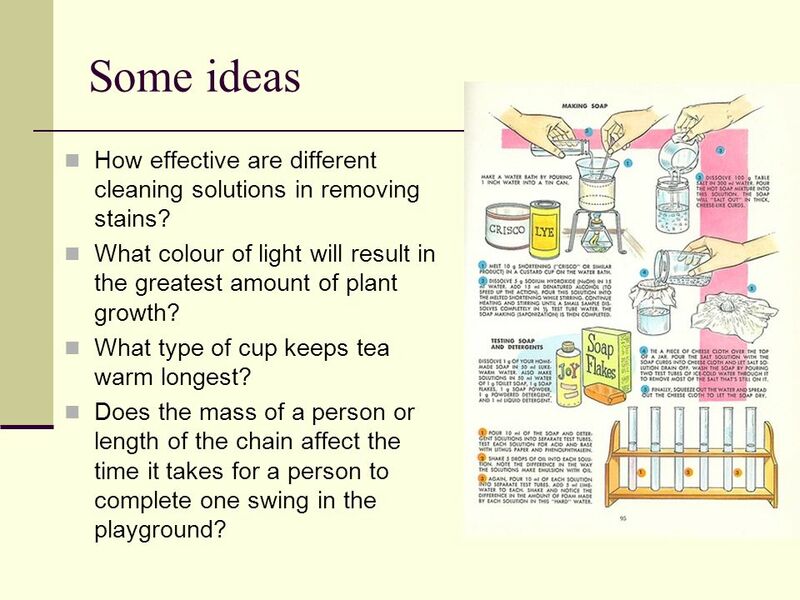 What colour of light will result in the greatest amount of plant growth? What type of cup keeps tea warm longest? Does the mass of a person or length of the chain affect the time it takes for a person to complete one swing in the playground? 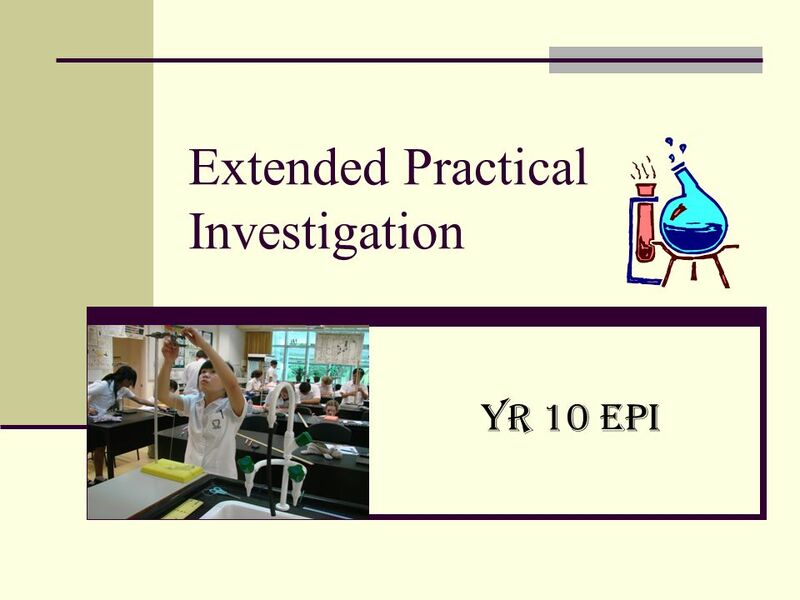 Download ppt "Extended Practical Investigation Yr 10 EPI. 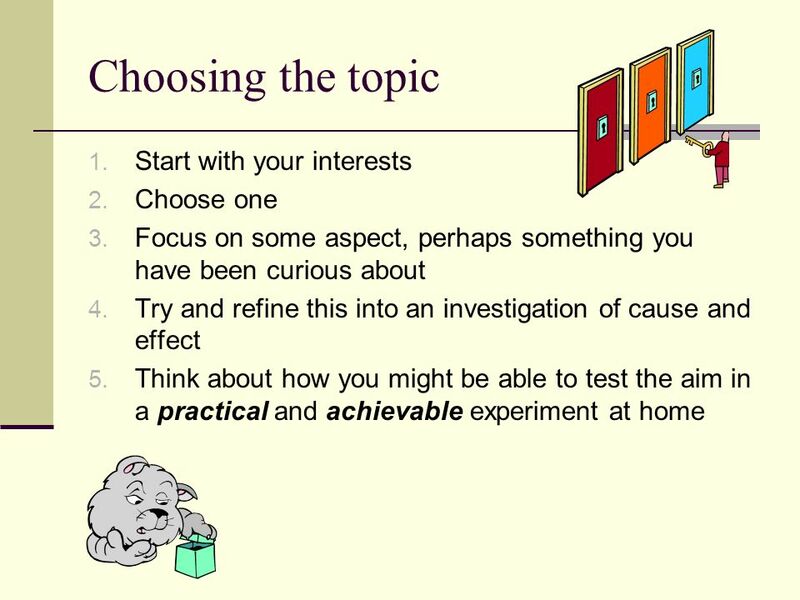 Yr 10 Science EPI Builds on your skills from Years 7 - 9 You choose the topic of investigation All research." 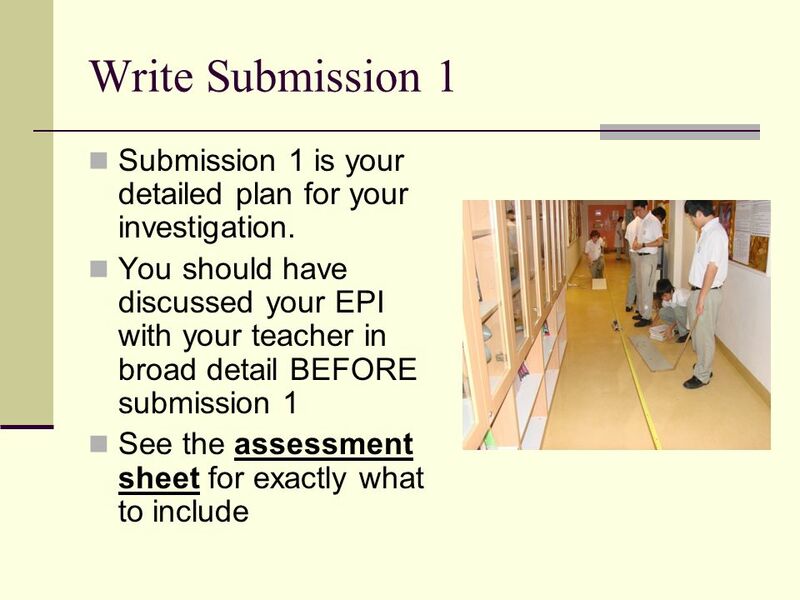 Internal Assessment Your overall IB mark (the one sent to universities after the IB test) in any IB science course is based upon two kinds of assessments. The Science Fair Getting Started How do I go from this? to that? 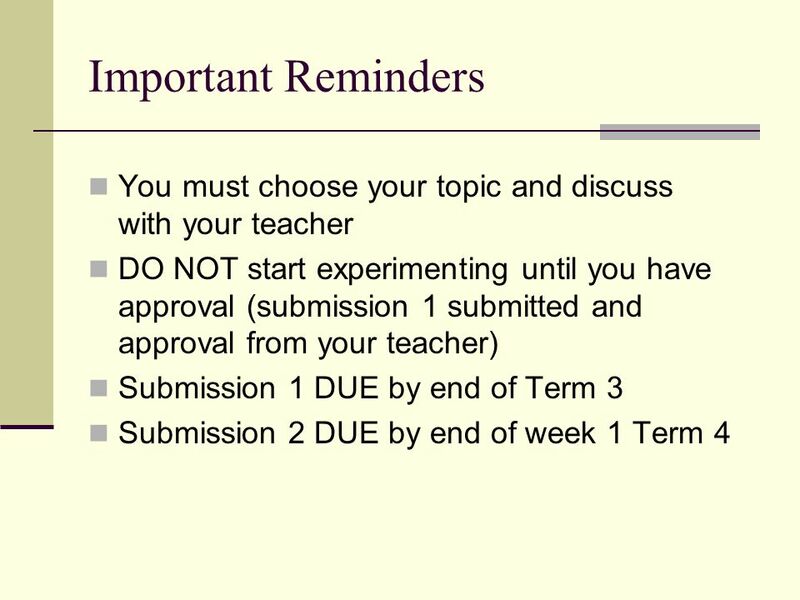 Science Fair Tips Guidelines For Producing Award Winning Projects. Scientific Method and Measurement Mrs. Lorenz Foundations of Science Biology. There are 3 main reasons for us to do this investigation. They are:  To get a fundamental understanding of ‘WHAT IS SCIENCE’.  To earn richer knowledge. Investigation - Projects that use the scientific method to solve an original problem. LI: To identify and use a thermometer as an accurate method of measuring temperature. Steps to Success… Investigate room temperature in different parts. 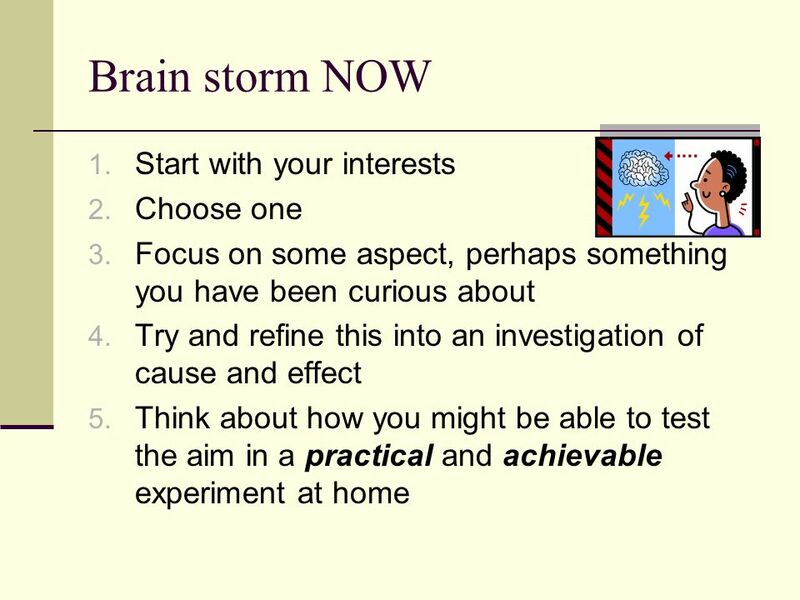 Your Guide to Successfully Using Scientific Method! Created for the teachers at Mauro-Sheridan Interdistrict Magnet School by Monique M. Gibbs. Created by: Mrs. B-D 2007 Experimenting with the Scientific Method.